The scenario was updated to Unoffical Patch 1.4. resources. Requires also full install of "Wizards&Heroes3" mod. Gameplay difficulty is not so high as it was in the original scenario. Black player now is not so deadly as it was earlier. Wizards were rebalanced in accordance with WH3 ruleset. Heroes and Wizards now use custom portrait libraries. This made possible to reduce size of the scenario file. Also I added some "life" to landscape. Different houses and villages are now scattered here and there. It looks more natural than just cities and seemingly uninhabited surroundings. I just made a scenario for gaming and roleplaying, not for contests and records. So, enjoy! 6. 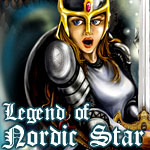 You will need the sword Nordic Star to defeat Algernon. Otherwise it will be hard to kill him. 2. Ensure that you have installed "Wizards&Heroes3" mod. 3. Ensure that you don't use Custom Resources. 4. Enjoy! This scenario was made for gaming and roleplaying, not for contests and records. A nice idea to reuse a good map. However, the comment about it being somewhat easier is probably not true. The stack by the Nordic Star with the 7 Leprechauns is very difficult. The main "difficulty" om this map is the black player. His powers were really lowered. As for leprechaun - this unit is ment to be the most nasty unit in the game. He knows many tricks that make him strong against low level units, but his low hitpoints make him a risky unit.